In the camping and marine sector, compressor coolers are the first choice for cooling food and drinks. They are space-saving, self-sufficient and sustainable. state from liquid to gaseous. Most household refrigerators and freezers work according to this principle. Today's compressor cooling boxes are operated either with a Danfoss compressor, or a vibration compressor, which consumes comparatively little power (maximum of 32 watts no matter what size), and also works flawlessly even in inclined positions. Compressor coolers are primarily suitable for use in caravans, motor homes, boats, but also in the medical or pharmaceutical sector. Here they have their strength in the excellent cooling performance, cooling time and the lower starting current. Nowadays, the compressive technique is used if one wishes to be independent of the ambient temperature. These boxes have a very high efficiency, so that they can easily be operated over 12/24 V. Of course, operation with 110/220 V is also possible via a converter. There are also differences in compressor coolers with the oscillating head principle. Low-cost models often have poorer insulation, or higher power requirements. However, as soon as you move in the middle price segment, compressor coolers are absolutely independent of the prevailing outside temperature, and offer a very good cooling performance at low power consumption. There are some manufacturers whose coolers have a lifetime of up to 30 years, thanks to excellent PV insulation, CFC freedom and excellent processing. The disadvantage with good compressor boxes is certainly the higher price and a slightly higher noise level of the running compressor. However, this is hardly noticeable due to the relatively short duration of about one third of the day. 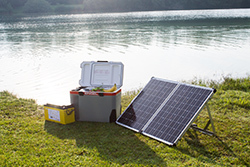 Most modern boxes can be powered by an 80 - 100 watt module. In summary, it can be said that in the recreation area, the purchase of a compressor cooler box is almost always worthwhile compared to a thermoelectric or absorber cooling box. The higher price is justified by the much longer service life and the lower power consumption! Steca PF refrigerators are some of the most efficient DC energy-saving refrigerators ever developed. 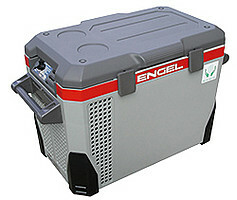 Now filled with an even more climate-friendly refrigerant, they can be used as either a refrigerator or a freezer. The Steca PF 166-H and Steca PF 240-H are fully programmable. The inside temperature and each of the other configuration values can be set by the user. They are therefore perfectly suited for all DC applications including even the refrigeration of medicines in hospitals. The optimal electronic control and speed regulation of the compressor guarantees extremely efficient use of energy. This leads to significant cost reductions. This product stands out for its user-friendliness, thanks to a large digital display with setting options, the highest standards of quality and reliability, energy efficient interior LED lamp and a long service life. The refrigerator or freezer is easy to clean as it has a sealing plug on the bottom for draining water.